Indigenous Peoples, local communities, environmental activists, and women’s groups from 25 different countries today kicked off a week of protests, meetings, and events to demand respect for community land rights. Despite clear evidence that communities are the best guardians of their lands and the world’s forests—highlighted in a new policy brief—governments are giving the go-ahead to dams, coal mines, palm oil plantations, and other projects that rob the forests’ customary owners of their homes and livelihoods, and threaten the climate and resources we all depend on. 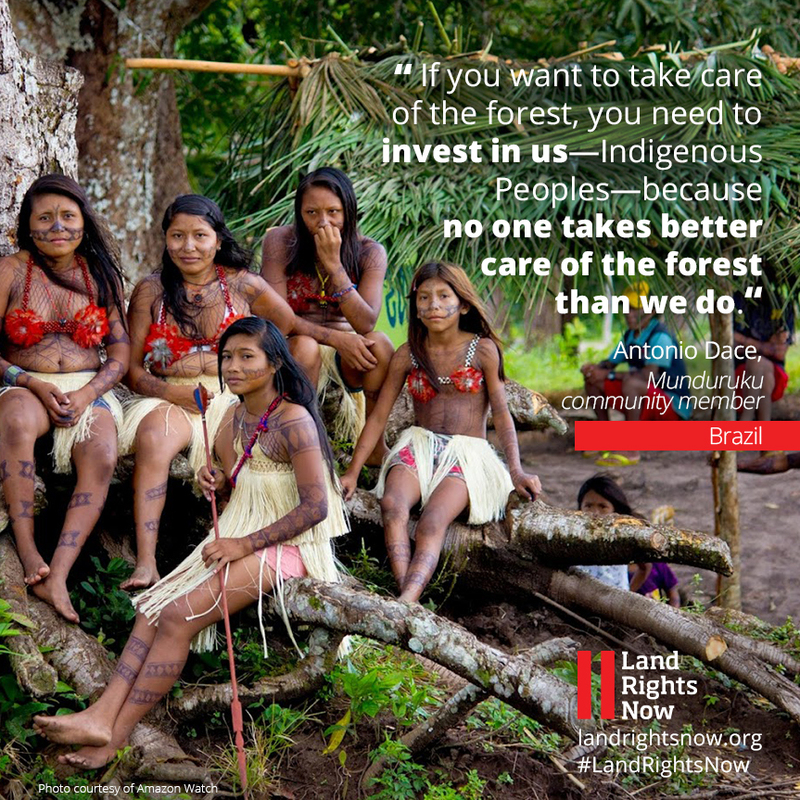 These actions are part of the Land Rights Now initiative, a global campaign launched in March 2016 to double the amount of land owned or controlled by Indigenous Peoples and local communities by 2020. “We have the right to decide our own future and survival, and are carrying out projects that protect our territory and protect our planet from the impacts of climate change,” said Manari Ushigua, President of the Sápara Federation in Ecuador. The Munduruku people in the Brazilian Amazon, communities in Lamu in Kenya, the Maya Qéqchi people in Guatemala, and the Pinuyamayan community of Kasavakan in Taiwan are demanding respect for their rights in response to threats from powerful business and government interests who seek to expropriate their territories for agribusiness or infrastructure projects. Today, these communities called on their governments and the private sector to respect their rights in order to support communities’ role in protecting the world’s biodiversity and preventing climate change. Communities like these have successfully safeguarded many of the world’s forests for generations. Research shows that where communities have secure rights, carbon storage and biodiversity are higher and deforestation rates are lower. Yet communities only have legally recognised rights to one-fifth of their customary lands, according to research from the Rights and Resources Initiative. The insecurity of indigenous and community tenure rights poses a significant threat to global efforts to prevent the climate crisis: at least one-tenth of the carbon stored in the world’s tropical forests is in community lands that lack formal, legal recognition, leaving them vulnerable to land grabs that can destroy livelihoods and devastate the environment. In Brazil, once considered a leader in protecting indigenous land rights, regressive government and business interests are recklessly targeting Amazonian indigenous lands for infrastructure projects, leading to an unprecedented rollback of hard-won protections of their rights. Today, the country’s indigenous movement called on Justice Minister Osmar Serraglio, a former leading member of Brazil’s agribusiness congressional bloc, to stop the assault on indigenous rights and to protect indigenous lands. Secure, legally recognized land rights are required to halt projects such as the São Luiz do Tapajós mega-dam, which threatens the Munduruku and other indigenous communities in some of the most biodiverse and environmentally valuable forest in the world. Movement leaders also called on Serraglio to cease efforts to pass a Constitutional Amendment (PEC 215) that would stall the titling of indigenous lands. Yet recent actions by the government are putting these carbon stores at risk. “The [Brazilian] government is coming here to get rid of everything—the natives, the forest and the river,” said Chief Juarez Saw of the Munduruku. In Kenya, the Save Lamu Coalition called for the cancellation of a proposed project to construct East Africa’s first coal plant in Lamu, a coastal county in Kenya. The plant would cause enormous damage to the sensitive ecosystems around Lamu, including the arable land, coastal waters, marine life, corals, and mangroves on which the local community depends. In Guatemala, Q’echi’ communities in Raxruha in the Alta Verapaz region have seen a huge increase in palm oil production, with many community members forced off their lands. Today, palm oil plantations are rapidly expanding into surrounding villages. Community assemblies have ensured the preservation of the forests that form the basis for their livelihoods for generations, and practiced equitable distribution of resources between community members. This way of life is now under threat, and the forests they have long protected are at risk of being destroyed to make way for environmentally destructive oil palm plantations. Today, the Network of Communities Affected by Palm Oil called on the government to stop the expansion of palm oil agribusiness that violated the community’s land rights, and to require companies to repair the social and environmental damage they have inflicted on communities. Margarita Osorio, a local women’s leader and land rights activist, said, “The destruction of the forests began when they started planting palm oil. We feel challenged and intimidated by the way they criminalize and threaten us.” Where communities resist land-grabs, they often face criminalization and violence, with women and Indigenous Peoples particularly vulnerable. In Taiwan, the Pinuyamayan people in the community of Kasavakan joined indigenous organizations across the country to oppose a recent government regulation that denies Indigenous Peoples in Taiwan any recourse to assert their land rights on what are considered privately owned lands putting at risk their ancestral community forests. The community recently lost ten acres of their ancestral forest to private development. Today’s actions are part of a growing movement by indigenous and local communities around the world demanding respect for their rights, mobilising to ensure that their voices are heard, and highlighting the role they play in the global struggle to prevent climate crisis. Land Rights Now is an open campaign that aims to double the area of land recognised or owned by Indigenous Peoples and local communities by 2020. Over 550 groups are part of Land Rights Now. The campaign contributes to the Global Call to Action on Indigenous and Community Land Rights, a solidarity movement of organizations and communities to promote the land rights of Indigenous Peoples and local communities. Visit www.landrightsnow.org.